Never has a movie inspired such tear-stained reminiscence among my close friends and family - some of whom worked in F1 racing - as Asif Kapadia's new documentary, SENNA. For those of us who watched racing in the 80s and 90s, Ayrton Senna was an icon. Young, handsome, rich, for sure, but more than that - brilliant at driving in wet conditions, and bold in exploiting a gap to take the lead. He was everything a racing driver should be. Of course, at the time, as a kid, while I knew of his rivalry with the French incumbent world champion, Alain Prost, I hadn't realised just how poisonous that rivalry had been, nor the mechanics of their famous clashes in Japan. Nor had I realised just how political FISA had been, with its French boss, Jean-Marie Balestre apparently hand in glove with Prost, the Sepp "Colonel" Blatter of his day. I hadn't appreciated how revolutionary the Williams' team use of electronics in the early 1990s had been, and that this had prompted Senna's move from Maclaren run by the true gent., Ron Dennis. I remembered the tragic build-up to race day at Imola 1994, but I had no idea how reluctant Senna had been to race that day. The memory of that day is still with me. It's like remembering Hillsborough - one of those searing moments where you realise that you are watching tragedy unfold in front of you in real time, and feeling powerless but transfixed - that a young handsome boy who had so much talent had died on, of all things, the seemingly benign Tamburella turn. The brilliance of this documentary is twofold. First, that the director and producers managed to persuade the Senna family and Bernie Ecclestone to co-operate - giving them access to the home videos, their impressions of what Ayrton was thinking at crucial moments, not to mention the extensive F1 archives, with footage of everything from on-board cameras, to drivers' briefings, to conversations in the pit. This level of access is unprecedented and results in a documentary that has the freedom of a feature film in terms of camera placing and editorial choices. More importantly, it takes the movie beyond recreation of key races to the emotional state of mind of Ayrton - most crucially in interviews with his sister and team-medic. But access is a necessary but not sufficient condition for a great documentary. And SENNA *is* a great documentary. The reason for that is that it has a clear narrative arc (kudos to writer Manish Pandey) and some of the tropes of a classic fiction drama. This helps focus a film that could've been over-whelmed by the sheer weight of material, and become unbalanced by Imola. Indeed, the wonderful thing about this doc. is that it focuses on Senna's life - gives you a sense of how important his faith was to him, reminds you of his charitable work, situates him within a loving but fearful family, and shows both sides of his character - both the integrity and humility but also the pride and fall from grace in Suzuka 1990. The resulting documentary is insightful, well-constructed and powerful. I started crying at Interlagos 1991 - the sheer force of will that made Senna drive 10 laps with just sixth gear and to lift that trophy in front of his home crowd. And when the race day at Imola began, it was game over. That sense of anticipation - the directorial choice to keep us with the on-board camera - and Antonio Pinto's sensitive score....What can I say? It all adds up to a documentary that is unmissable for F1 fans, but - and here I can speak to the experience of Doctor007 - a movie that works even for those who have never heard of Ayrton Senna. For Doctor007, SENNA worked as a fascinating character study that gripped him on an almost Shakespearian level. After all, is there anything more archetypal - more universally translatable - as the story of a young pretender facing an older incumbent - of a man of faith battling the corruption of the establishment - of the under-dog making good - of a good man dying young? 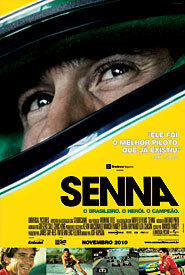 SENNA opened in Japan and Brazil in 2010 and in Italy, Germany and France earlier this year. It played Sundance 2011 and opens in the UK on June 3rd. It opens in Australia on July 21st. Best documentary ever, even for those who doesn't follow F1.